New flagship Monster Hunter due out winter in Japan. 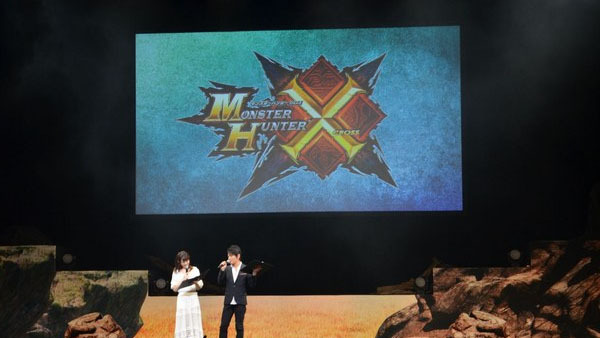 Capcom took the stage at its Monster Hunter Meeting 2015 event in Tokyo to announce two new entries in the popular hunting game series. Update: Watch the debut trailer here. The latest entry in the Monster Hunter series is Monster Hunter X (Cross), due out this winter in Japan for 3DS. The game promises new super actions for all weapons, new moves, new areas, and new monsters. It is built on the same engine as Monster Hunter 4 Ultimate. The concept of the game, according to Capcom, is taking the action and making it varied enough that everyone can find their own style. Actions will have more variations and numbers, and classes now have special attacks that you can activate to accent those actions. There are four styles of play, which change up your special moves. The game’s base village is Beruna, which is set at the base of a massive mountain range. Villages from previous Monster Hunter games, including Pokke Village from Monster Hunter Freedom 2 and Yukumo Village from Monster Hunter Portable 3rd, will also appear. There are four main monsters, four villages, and four different styles of play. If you have save data for Poka Poka Airou Village DX (announcement below), there’s a special bonus in it for you. Originally launched for PSP in 2010 (sans DX), the From Software-developed Monster Hunter Diary: Poka Poka Airou Village DX is coming to 3DS in Japan on September 10 for 3,990 yen. The spin-off sees players direct the series’ felyne cat characters through quests and manage their village. The 3DS version will have various collaborations, such as Mario and Animal Crossing outfits. Thanks, Adam Evanko and Famitsu.